I expect this is very delicious- If you ever suppose you try it. It is very little trouble pound and a quarter of sugar for each pint of berries. Red Raspberry and Pineapple Jelly. Wash a ripe pineapple and cut it small without paring, the skin holding a peculiarly fine flavor. Set it over the fire in a farina (double) boiler and cook very tender. At the same time heat red raspberries enough to give out twice as much juice as you get from the pineapple. 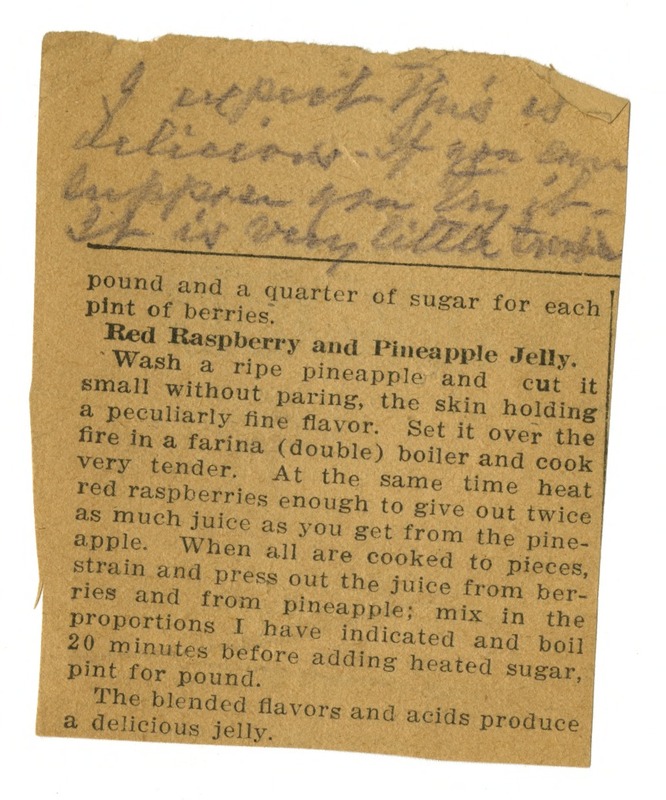 When all are cooked to pieces, strain and press out the juice from berries and from pineapple; mix in the proportions I have indicated and boil 20 minutes before adding heated sugar, pint for pound. The blended flavors and acids produce a delicious jelly.